For our March event in San Francisco, we held a group viewing of “32 Short Films About Glenn Gould.” The movie is an odd collection of vignettes and is very fitting for such an iconoclastic person. Prior to researching this film and Glenn Gould himself, I’d spent shockingly little time thinking about/listening to Bach’s Goldberg Variations, a collection that is commonly associated with Glenn Gould’s name and virtuosity. We discussed Gould’s life, the Goldbergs, and the concepts of fame and timelessness. What we thought would be a simple evening of film and discussion turned into a week-long Bach and Goldberg extravaganza — the inspiration for this blog post. Below are our nearly-five recommendations for your Goldberg Variations exploration pleasure. 1. Get Your Listen On! What better way to get started than by listening to the Goldbergs! The most reputable recordings of Bach’s Goldberg Variations were performed by Glenn Gould (twice) and Simone Dinnerstein. All are awesome. If you’re feeling really ambitious, download all three and have a Goldberg Variations field day. Glenn Gould’s recordings were released in 1955 and 1982, while Dinnerstein’s came out in 2007. 2. Get Your Read On! The morning after our film-viewing sesh, pianist Jeremy Denk began a week-long series of blog posts on NPR Classical’s website. They are fabulously funny. Read these for a good laugh and a peek into one pianist’s love-hate relationship with the Goldberg Variations. While you’re at it, why not read a little about the man behind it all? Wait, who is that again? J.S. Bach, my friends. He is THE MAN. 3.5. Yo, so how about reading a bit about the Goldberg Variations too? That’s why we’re here. Right? Wow, guys. That was a lot of reading. You rule! Time to listen to some more awesome music. 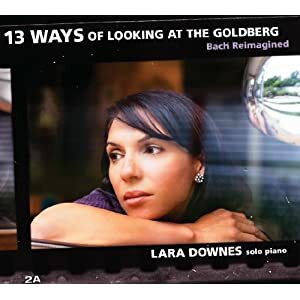 Lara Downes’ “13 Ways of Looking at the Goldberg” was released in 2011 and is a fantastically eclectic recording. From Lara’s website:Thirteen new “re-imaginings” of Bach’s Goldberg Variations, including works by Jennifer Higdon, Lukas Foss, David del Tredici, William Bolcom, Fred Hersch and Derek Bermel. These brilliant contemporary voices invoke the Goldbergs in broadly different ways, celebrating both the eternal beauty of Bach’s music and the musical evolutions of the past 250 years. Visit Lara’s website to hear some sample tracks and to download the recording. Many thanks to Maura Lafferty, who gave away two copies of this wonderful album as prizes at our film screening event! What do you love about Bach’s Goldberg Variations? Join the conversation in the comments section below!